$23MM dollars…that’s a lot of money that you could do a lot with. 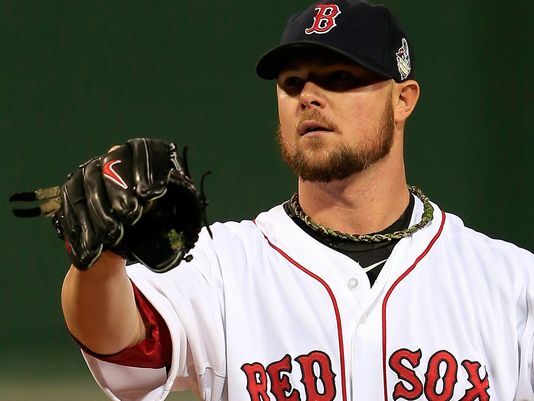 According to CBS Sports’ Jon Heyman that’s the annual average of the six-year $138MM offer the Chicago Cubs have reportedly made to Jon Lester. The Cubs approach is a bit puzzling. In July they dealt their number one starter, Jeff Samardzija, to the Oakland A’s for a package at that included shortstop prospect Addison Russell. President of Baseball Operations Theo Epstein must have have a jones for Russell, because why deal Samardzija when he still had a year left on his contract? Epstein said the Cubs goal in 2015 is to win the NL Central. Isn’t that a team’s goal ever year, to win their division? Imagine if Lester decided to sign with Chicago. They could have had a 1-2 punch of Lester and Samardzija. When the trade deadline rolled around, they could have dealt Samardzija if the team was well out of a playoff run. Instead they deprived their fans of a possibly better chance to make the postseason. Wrigley Field is undergoing a $575MM renovation and so Epstein wants to get a team in that will please the fans and not just because they are “a fun bunch”. They have plenty of good young players in offensive positions, but there isn’t a lot of experience among the starting pitching. The current Cubs rotation with their 2014 stats (Games started, record, ERA) are Jake Arrieta (25, 10-5, 2.53), who rejuvenated his career after leaving Baltimore, Travis Wood (31, 8-13, 5.03), Kyle Hendricks (13, 7-2, 2.46 – 17 additional starts in minors), and Tsuyoshi Wada (13, 4-4, 3.25 – 18 additional starts in minors). Jacob Turner, who split last season between the Miami Marlins and Cubs, Felix Doubront, who played for the Boston Red Sox and the Cubs, and minor leaguer Eric Jokisch are all candidates for the back end of the starting staff. Fans of the Miami Marlins, those who will admit to it, let out a collective gasp this past season when ace Jose Fernandez had to undergo season ending Tommy John surgery. Fernandez, the 2013 NL Rookie of the Year and third place finisher in the NL Cy Young race, was limited to eight starts in 2014. He began a throwing program two months ago and has a target date of July, 2015 for his return. Owner Jeffrey Loria and GM Dan Jennings know what a hard nosed and successful pitcher they have in Fernandez and are hoping to give him an extension past the first two years of his free agent eligibility (2019-2020). A reported six-year, $40MM offer has been proposed to Fernandez’s agent, Scott Boras. The Marlins have also offered extensions to outfielder Christian Yelich and shortstop Adeiny Hechavarria, and are expected to make a long-term offer to outfielder Marcell Ozuna as well. On the heels of Saturday’s reported discussions between Oakland and Atlanta about A’s starter Jeff Samardzija, came reports later in the day that the Chicago White Sox were talking to Oakland as well. 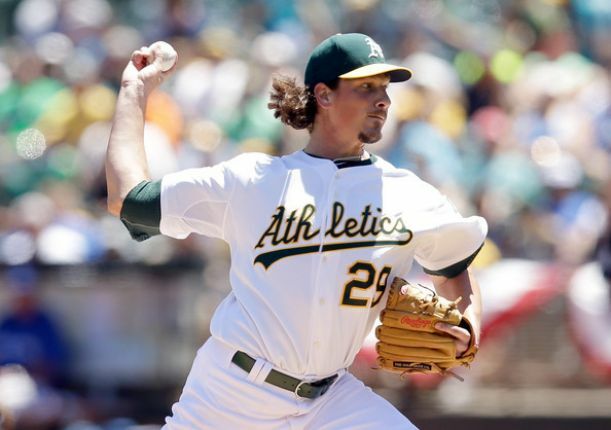 On Sunday, Nick Cafardo of the Boston Globe reported that Boston is also talking to the A’s about Samardzija. According to the Chicago Sun-Times’ Daryl Van Schouwen, the A’s are interested in White Sox shortstop Alexei Ramirez and prospect Tim Anderson, also a shortstop. After a pair of down years at the plate, Ramirez hit 15 home runs and slugged .408 in 2014. He also drove in 74 runs, the second highest total of his career. The 33-year old native of Cuba has one year and $10MM remaining on his contract, with a $10MM team option and $1MM buyout for 2016. Anderson was ranked this past January by Baseball America’s John Manuel as the third best prospect in the White Sox organization. He was the 17th overall pick in the MLB Amateur draft in 2013 out of East Central Community College (Decatur, MS). The 21-year old played at three different levels last season, including 68 games played at Advanced ‘A’ Winston-Salem (Carolina League) and 10 games at Double-A Birmingham (Southern League). He was limited to 83 total games due to a fractured wrist that caused him to miss two months. Marcus Semien, who played 64 games for the White Sox last season, is also thought to be a possibility for Oakland. Semien is a third baseman/second baseman, who Manuel ranked as the 5th best prospect in the organization prior to the 2014 season. He had a mere .300 on-base pct. for Chicago, but slugged a respectable .372. No names have been mentioned in any Red Sox rumors with Oakland, and Cafardo feels Samardzija would be a plan B or C if they Red Sox can’t bring back Jon Lester or deal for the Phillies’ Cole Hamels. 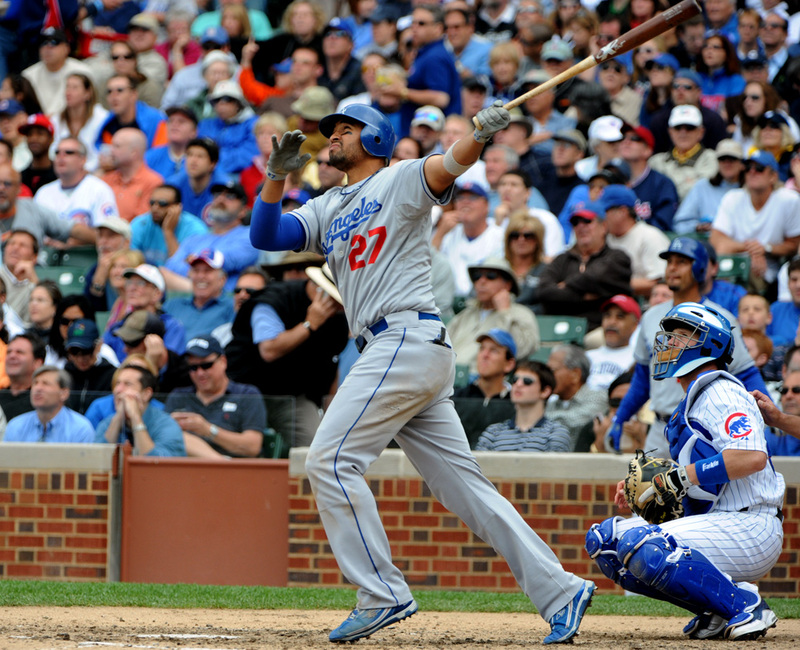 According to FoxSports’ Ken Rosenthal, the San Diego Padres have talked to the Los Angeles about outfielder Matt Kemp. It’s hard to tell what exactly San Diego’s offseason plans are. This is a team with a low payroll that has talked to Lester and other high priced free agents. Does it represent a change in philosophy or a way to promote season ticket sales? Kemp finished second in the NL MVP vote in 2011, also known as the year Ryan Braun cheated his way to it, after he hit 39 HR and drove in 126 runs. Hamstring and shoulder injuries limited Kemp to 179 games combined over the next two seasons, but he turned in a respectable, healthier 2014. Playing in 150 games, Kemp hit 25 HR, drove in 89 runs, and put up an .852 OPS. The biggest deterrent in any trade for the 30-year old is the five years and $107MM still due to him on his current contract. The Oakland A’s dealt All-Star third baseman Josh Donaldson to the Toronto Blue Jays Friday night, will not be able to resign ace Jon Lester, who was picked up at the 2014 trade deadline for Yoenis Cespedes, and are now rumored to be talking to the Atlanta Braves about outfielder Justin Upton and catcher/outfielder Evan Gattis. According to John Hickey of the Bay Area News Group, the price would be a high one. Starting pitcher Jeff Samardzija, who was picked up at the July trade deadline from the Chicago Cubs for a package that included starting pitcher Dan Straily and shortstop prospect Addison Russell. Samardzija is under control for one more season before he reaches free agency. He earned over $5.3MM last season and will get a significant boost based on his performance between the Cubs and A’s in 2014. Should he go to arbitration, Samardzija’s case will be further proof that a starting pitcher’s won-loss record is not very meaningful. Prior to being dealt to the A’s, the Notre Dame product was 2-7 despite a 2.83 ERA and 8.6 Ks per nine innings. As you would expect his ERA rose in the AL, but only to 3.14. He had an eight to one strikeout to walk ratio and a .262 BABIP or Batting Average on Balls in Play with the A’s and still finished just 5-6 in the W-L columns. The Braves, who have already acquired starting pitcher Shelby Miller from the St. Louis Cardinals, would probably like to hold on to Upton, but can’t because of another player’s contract that is an albatross around their collective necks. Ironically, that contract belongs to Upton’s older brother B.J. Upton, who the Braves erroneously signed to a five-year, $75.25MM contract prior to the 2013 season. The deal has been a disaster, with the 30-year old Upton posting OPS numbers you would expect from a pitcher – .557 and .620. Needless to say, the Braves can’t unload him. The 27-year old Justin, on the other hand, has surpassed an .800 OPS in his two seasons in Atlanta and won a Silver Slugger Award last season after he hit 29 home runs and drove in a career high 102 runs. The 28-year old Gattis hit 21 and 22 home runs in his first two seasons in the bigs, despite not reaching 400 at-bats in either year. Though he only caught and DH’ed this past season, Gattis played 48 games in the outfield in 2013. With just two years of Major League experience, Gattis is under the Braves control until 2019, which makes his inclusion in a deal (even for Samardzija) a head-scratcher. While the team’s rotation would be bolstered by the addition of Samardzija – he would join Miller, Julio Teheran, Mike Minor, and Alex Wood – the Braves would be hurting for runs scored. It’s understandable that the Braves would rebuild their starting staff,pitchers Kris Medlen and Brandon Beachy are expected to miss the entire 2015 season after both underwent their second Tommy John surgeries this past Spring. The acquisition of Miller cost the team outfielder Jason Heyward, which means Atlanta would be down three starters from their 2014 lineup, though perhaps someone like outfielder Josh Reddick could be sent along with Samardzija. The Braves added former Yankees prospect Zoilo Almonte this offseason and outfielders Jose Constanza, Joey Terdoslavich, and Todd Cunningham on their 40-man roster. Meanwhile the A’s starting rotation would be left with Sonny Gray and Scott Kazmir. Like the Braves rotation, the A’s had two pitchers – Jarrod Parker and A.J. Griffin – undergo Tommy John surgery this past Spring and can’t be counted on in 2015. Prospect Raul Alcantara, who has just two games of experience at Triple-A, could join the rotation some time during the season. Friday evening rumors swirled, via the SF Chronicle’s Susan Slusser and FoxSports Ken Rosenthal, that the Oakland A’s were in the midst of putting together a blockbuster trade. At first it was thought that pitcher Jeff Samardzija was to be involved, but that rumor was quashed by the two reporter’s sources. But a deal was being discussed and was finalized Friday night. The A’s sent their All-Star third baseman Josh Donaldson to the Toronto Blue Jays for third baseman Brett Lawrie and three minor leaguers – shortstop Franklin Barreto, and pitchers Kendall Graveman and Sean Nolin. Donaldson adds another serious power bat to a Blue Jays lineup that already features Jose Bautista and Edwin Encarnacion. It also does damage to an A’s lineup that was weakened at the past trade deadline when they sent outfielder Yoenis Cespedes to Boston for rent ace Jon Lester. 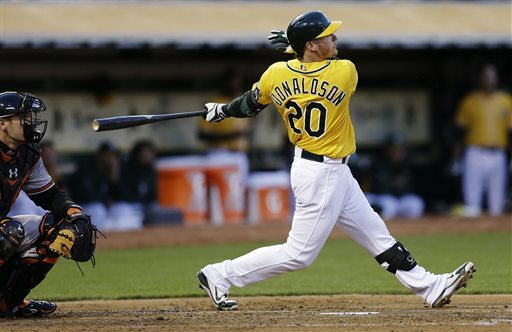 Donaldson, who will be 29 in a little over a week, hit 24 home runs and drove in 93 runs in 2013. He followed that up with 29-98 year this past season, though his OPS dropped nearly 100 points. The Alabama native made a mere $500K in his third full year in the Major Leagues and is arbitration eligible. Needless to say, he will earn a large raise for 2015 and it is likely the Blue Jays will try to sign him long term. Lawrie, who began his career in the Milwaukee Brewers organization, was dealt to the Blue Jays for pitcher Shaun Marcum in 2010. The former 16th overall pick in the 2008 draft, Lawrie has been a disappointment up to this point. Injuries have limited the 24-year old to 177 total games the last two seasons. After posting an OPS over .900 in 43 games in his first year in the Majors, Lawrie has recorded .729, .712, and .722 OPS numbers the last three seasons. He had begun to develop a good power stroke last season – 12 HR in 259 at-bats – but was shut down the last two months of the season due to a strained oblique. He had broken a finger earlier in the year that caused him to miss six weeks. Like Donaldson, Lawrie is in his first year of arbitration eligibility, but will make substantially less than Donaldson for the 2015 season. He earned $516K and change in 2014. As for the minor leaguers acquired, Barreto put together a .311/.384/.418 slash line last season for Vancouver (‘A’ ball). The 5’9″ shortstop was signed out of Venezuela and has two seasons in the Jays’ organization under his belt. Graveman, a 6’2″ right-hander, was drafted in the 8th round of the 2013 MLB amateur draft. He made his Major League debut this past September and appeared in five games with mild success. The Mississippi State product made a combined 27 starts this past season in four different minor league levels. Overall, he finished 14-6, 1.83 with 115 strikeouts in 167.1 innings pitched. He also averaged less than a hit per inning and issyed just 1.7 walks per nine innings. In his call up, Graveman averaged about 93 mph on his fastball and used a cutter and slider as his secondary pitches. Nolin was the Blue Jays 6th round pick (2010) out of San Jacinto College in Texas. He made one start for Toronto in 2013 (He didn’t make it out of the first inning.) and one relief appearance in 2014. Nolin made 17 starts for Triple-A Buffalo last season, finished 4-6, 3.50, and averaged 7.6 K’s per nine innings. He has a low 90s fastball and relies heavily on his changeup. 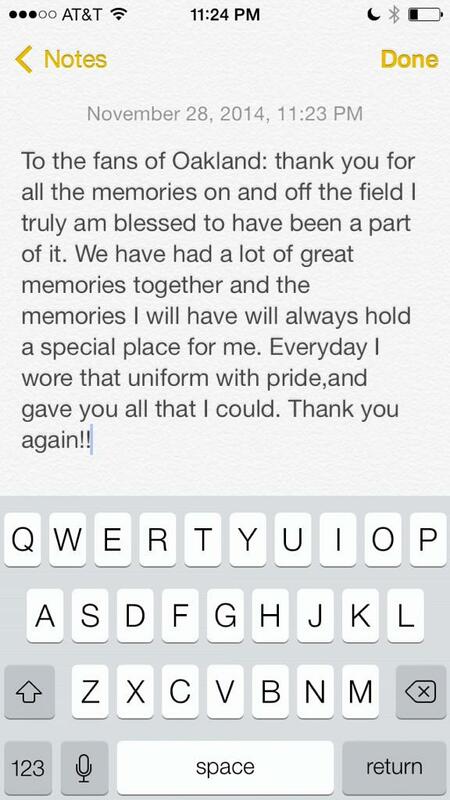 UPDATE – Josh Donaldson took to Twitter to thank the A’s fans. The A’s are banking on Billy Butler getting his power stroke back. 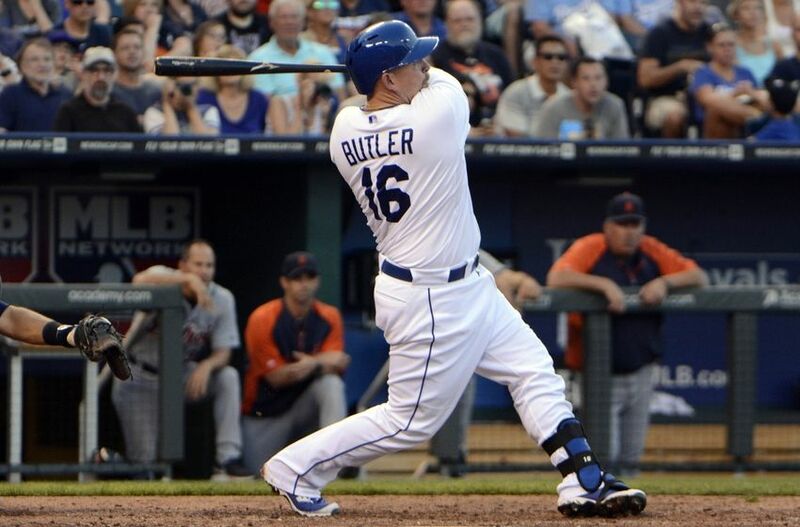 Billy Butler has been a fixture in the Kansas City Royals lineup since his rookie season of 2007. He was one of the few consistent productive players for the Royals teams that won less than 70 games a year. But after his best season (2012) – 29 HR 107 RBI .882 OPS 192 Hits – the lineup’s regular designated hitter saw his production drop off. It came at a time when the Royals had a resurgence and made it to the World Series for the first time since 1985. With young players like Alex Gordon ready to starting getting big money, it was an easy decision for Royals’ management to not bring Butler back. The 28-year old agreed to terms with the Oakland A’s Wednesday on a three-year, $30MM deal. It’s a slight bump in salary from the $8MM he earned the last three seasons in KC. Oakland is looking to Butler to replace some of the offense lost when they dealt Yoenis Cespedis to the Boston Red Sox for Jon Lester during the 2014 trade deadline. But will Butler be able to supplement the A’s offensive production in 2015? After a drop off to 15 home runs and 82 RBI in 2013, Butler only powered out 9 HR this past season and had a career low .379 slugging percentage. Butler is a station-to-station base runner and a prototypical designated hitter – he hasn’t played more than 37 games at first base since 2010 – so he needs to rely on his ability to drive the ball to be successful. Time will tell, but at $10MM per year, the contract could prove to be a a major bargain, especially for a player under 30.